Help! My Bathroom is Too Small! The eternal dilemma of finding your perfect home, in a perfect location, at a perfect price. Only the bathroom is too small! Do you compromise? Or do you keep looking? Truth is, many homes now suffer from small bathroom syndrome. And most homeowners are left scratching their heads when it comes to knowing what to do to solve the problem. Do you knock down walls? Do you build an extension? A small bathroom may be compact but it needn’t be a worry or an immediate no-go when it comes to finding that perfect home. In fact, by following a few of these simple tips, you’ll learn to love your small bathroom in no time! Of course we long for both a bath and shower in our miniscule bathrooms, but sometimes when that just isn’t possible, you’ll have to make that choice – one or the other. Whilst getting rid of a bath may seem wise and transforming the space into a shower or even a wet room, it may be better to do away with the shower altogether and opt for an over-bath shower instead. In fact, better yet why not consider an over-shower bath?! Position the shower against the longest side of the bath; fixed to the wall so the showerhead is central to the bath. This not only makes the experience feel more luxurious, it also makes your bathing seem a little grander. Everyone knows that mirrors and mirrored surfaces can do a lot to make rooms feel larger so why not invest in some mirrored tiles? They look super glam and are bound to brighten up even the smallest of bathrooms. Alter­natively, trick the eye into thinking that the room appears larger than it is by using tiles where the individual lines are harder to spot. 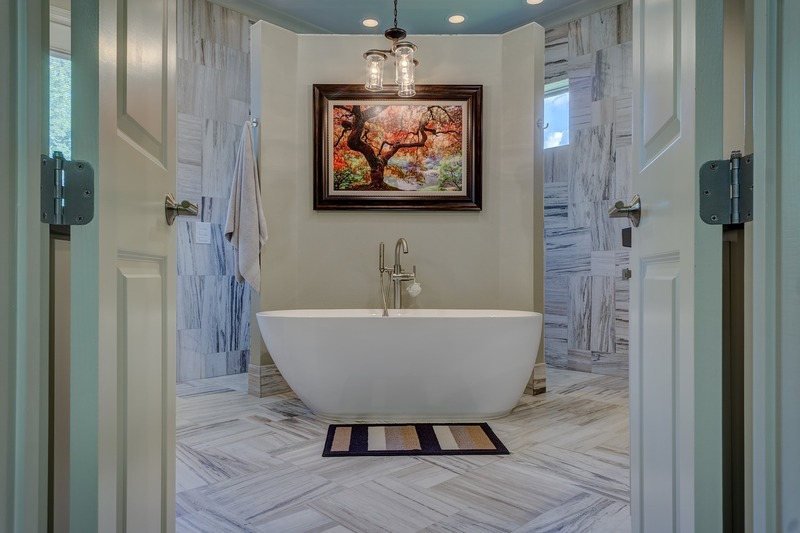 Marble tiles, for example, when placed together, can look like one continuous sheet and the blended appearance makes it harder to determine where each one begins – leaving the space feeling instantly bigger. 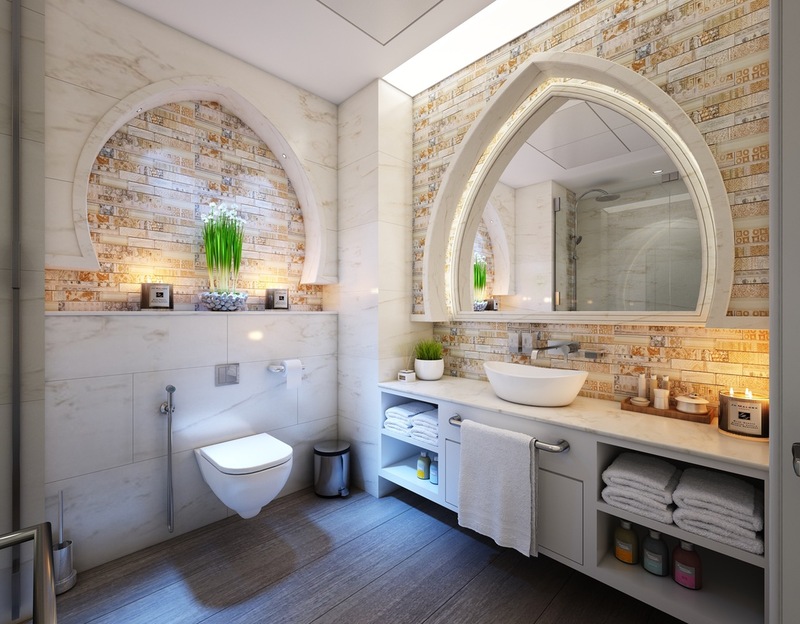 To ensure a coherent and cohesive space, be sure to use the same tiles on both the walls and the floor in your bathroom. It’s another little gimmick that can trick the eye into making dimensions appear bigger as the continuous run of tiles will make the room feel more spacious. Just don’t forget to mix it up a bit with some bright accessories such as towels and mats! Step into the bathroom. Take a look around. A real look around. How do your cupboards look? Do they swamp the tiny space? When shopping, it’s easy to purchase bathroom cupboards or storage solutions that would look great in a ‘family sized bathroom’ but when you’re living with a substantially smaller one, the cupboards will easily overpower the room and leave it looking swamped. Instead, consider tall and slim line cupboards that look compact but often have a similar amount of storage. Also, make the most of awkward nooks and crannies such as corners. Utilise the space by investing in corner cabinets or shelving units and scope out any potential places for wall hanging storage too such as mirrored wall cabinets to keep the room looking neat and tidy. If you’re feeling really brave and you’re looking to create some extra storage – it may be worth considering recessed shelving. Recessed shelving involves cutting into the unused wall space and creating a beautiful yet space-saving place to display all your knick knacks, treasures or toiletries leaving you to remove some of those dominating cupboards and cabinets from the bathroom! How do you make your bathroom look bigger? Be sure to let us know via Facebook or Twitter.